Last night, Jay Diggs and I attended a fundraising event at the Maryland State Fairgrounds for several candidates. 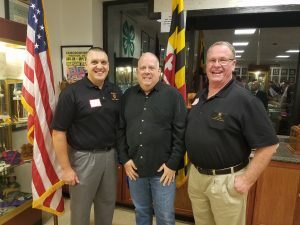 We had the honor of speaking with Governor Larry Hogan, Delegate Joe Cluster and several others. We had a chance to discuss our concerns regarding the retiree prescription changes with both candidates. Governor Hogan and Delegate Cluster both said they are committed to helping change the 2011 law during the upcoming legislative session. Both candidates, as well as many others, thanked us for our service to the citizens of Maryland. I continue to ask all sworn and retired members to contact your Delegates, Senators, etc. to ask for their support in changing the 2011 prescription law. By keeping this issue at the forefront and asking your politicians for their support, it’s the only way we are going to get this changed. We cannot allow laws like the 2011 prescription change to continue or it will only get worse in the future. Our medical benefits will slowly be taken away until we are left with nothing. Active Troopers need to become more involved and closely monitor the bills that are presented in the General Assembly because it will eventually affect you too. Come to your local MTA Lodge meetings, run for elections at your Lodge, ask questions, and get involved. « Death Notification – Retired D/Sgt. Donald Cox, Sr.